Two mighty statues, carved in the likenesses of Isildur and Anárion, that guarded the passage of the Great River Anduin. They marked the ancient northern border of Gondor. We do not know exactly when the Argonath were constructed, but the available evidence points to the middle of the thirteenth century of the Third Age. This would probably have been during the reign of Narmacil I, though they would have been built under the direction of his Regent Minalcar (who later ruled Gondor in his own right as Rómendacil II). Though the date of their construction is not entirely certain, the historical context of the Argonath is well established. Gondor's influence at that time extended far up the Vales of Anduin, but in this period an influx of Northmen were beginning to establish themselves in the lands northward and eastward of Nen Hithoel. 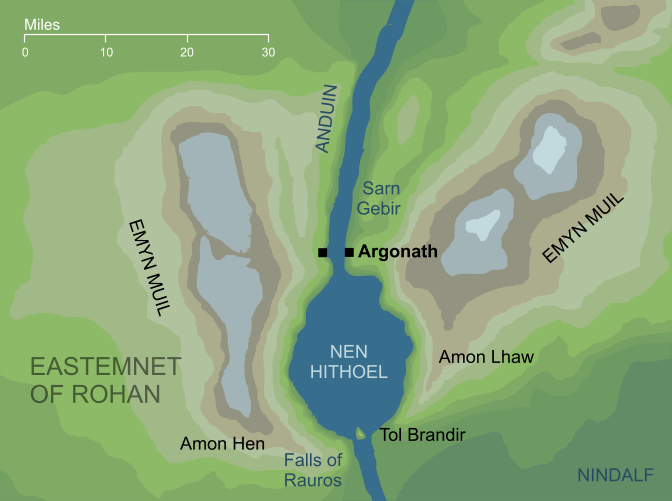 Seeking to accommodate these people, Gondor consolidated its border at the Emyn Muil, marking that point on the Great River by placing a great warning stone on either side of the stream. Beyond these stones no stranger was permitted to pass downriver without permission. These huge stones were carved in the likenesses of the founding Kings of Gondor, Isildur and Anárion, the sons of Elendil. Built on great pedestals founded in the river, each was carved with a stern expression on his face and a crowned helm on his head. The left hand of each stone King held up in a gesture of warning, while the right carried an axe3. At the time that the Fellowship of the Ring sailed through the channel between the statues, they had guarded the river for nearly 1,800 years, and though they naturally showed signs of weathering, they still remained intact. By this point in history, the border they had been set to guard had retreated southward, and they had not truly been the Gates of Gondor for some five centuries, but nonetheless they cast their baleful glare down on travellers as they passed between the stones of the Argonath. The details of the Argonath's origins given in this entry are taken from Appendix A (iv) to The Lord of the Rings, which states of Rómendacil II: 'He it was that built the pillars of the Argonath at the entrance to Nen Hithoel.' Rómendacil was King of Gondor between the years III 1304 and III 1366, but before taking the throne he had served as Regent since III 1240, and the context of this quote strongly suggests that Pillars were raised during his Regency period, in about the year III 1250. To complicate matters, all of this seems to be flatly contradicted by The Silmarillion. In Of the Rings of Power and the Third Age, the raising of the Pillars is apparently described as taking place long before, during the last years of the Second Age: '...works marvellous and strong they built in the land in the days of their power, at the Argonath...' This is probably a simple error (and as the ultimate canonical source, the account in The Lord of the Rings must take precedence). To resolve this apparent contradiction, we might imagine that the 'marvellous works' raised in Elendil's time weren't necessarily the Pillars of the Argonath themselves - perhaps they refer to the seats on Amon Lhaw and Amon Hen, or the long narrow channel that led into Nen Hithoel, with the mighty statues at the entrance to the channel being raised more than a thousand years later by Rómendacil. It's very doubtful that Tolkien intended any of this, but it does help to reconcile the contradictory accounts. In Sindarin, the -ath ending usually indicates a very large number of things, as in Osgiliath ('fortress of the host of stars') or Remmirath ('the many netted jewels'). The -ath ending of Argonath has a quite different etymological origin, though, and signifies 'two'. For a full treatment of the etymological origins of Argonath, see The Letters of J.R.R. Tolkien, No 347. The reasons for depicting the statues of the Argonath armed with axes are not entirely clear, as the usual weapon of the Gondorians had historically been a sword. This is perhaps a reference to the Númenórean lineage of Isildur and Anárion. The earliest Númenóreans were said to have favoured axes in times of peace, so this was perhaps a conciliatory gesture toward the Northmen; if so, it seems a rather implausibly subtle one. Original content © copyright Mark Fisher 1999-2001, 2004, 2013. All rights reserved. For conditions of reuse, see the Site FAQ.